This plugin allows you to push your 3D model to many platforms for AR/VR purposes with simply one click. You set your 3D view with section box and click push to device. You instantly will be able to see the model in HoloLens, GearVR, iPhone, iPad and Android devices. 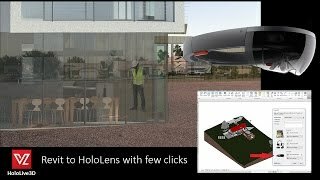 HoloLive (Available): Allows you to upload your models from Autodesk® Revit® to HoloLens and position the model to the right coordinate system using marker/survey control in the field or you can visualize it with smaller scale using the scale tool in HoloLive app. MobiLive (coming soon): Allows you to upload your models from Revit to iOS/Android so you are able to walk into the model with your touch, orbit around the model and take advantage of AR capability. VRLive (coming soon): Allows you to upload your models from Revit to a virtual reality headset, mainly GearVR and be able to walk in your design. This app is great and has saved us loads of time.